I have a degree in Computer Science, with a minor in Economics. But I earned that degree at Hamilton College, a traditional liberal arts college. That meant I was forced (now students there are just encouraged) to take classes in a variety of disciplines. I went to Hamilton in part because they offered degrees in Computer Science and History, and I was interested in both fields. In addition to the courses required by my major I took classes in history, religious studies, philosophy, art, and more. And I learned critical skills for work and life because I took those classes. Making these mugs made me a better developer. 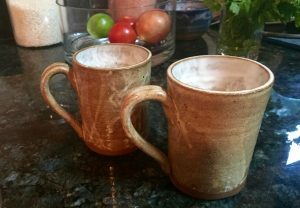 Ceramics and pottery taught me to be a craftsman, accept critical feedback, and admit failure. For all the courses I took in college, the time I spent in Ceramics and Pottery studio taught me more about how to be good at what I do than any other course work (including CS). Basic pottery is a craft that doesn’t allow you to save a piece once you’ve made mistakes. If you are making cylinders the walls aren’t straight throw it away and start again. My professor in those courses set very high standards and pushed us to meet them through brutally honest, but helpful, critiques. He taught me to appreciate honest feedback, and to be skeptical of my work before showing it others. In those courses we had to do good work, recognize our weaknesses, and hit deadlines. History taught me to care about communicating. Between the courses I took, and dating (and eventually marrying) a history major (now professor) I came to understand how important it is to communicate well in speech and in writing. I started this blog in part because I wanted to make sure I was spending more time writing to help maintain those skills. I frequently find myself in meetings having to explain highly technical issues to non-technical clients and colleagues. Knowing how to adjust to my audience, without insulting their intelligence, is a critical part of my day to day work. Religious Studies and Philosophy taught me to make a well reasoned argument and express the ethics of my position. Religious Studies and Philosophy both require you to make arguments based primarily on the strengths of your ideas – you can’t research your way out of a bad concept. If you cannot assemble a well reasoned argument you leave yourself open to easy counter attacks. When you work at a nonprofit you often are building your ideas and your explanations from a mix of the facts of the issue, your worldview, and the assumptions you are forced to make because no one has all the information they really need. Economics taught me how to view the world through the lens of money and trade. While I don’t think it’s the only, or even best, way to view the world it is a very important worldview that dominates the news and political spaces. Understanding the strengths and weaknesses of economics as a field helps me think about plans put forward by various politicians. It also helps me think about how the companies I work for function, and helps make sure internal systems and plans I propose have a strong business case to support them (and because I learned to throw things away in ceramics I also know that when the case is bad to stop and try something different). The most important skill I have is the ability to learn new skills. Since I graduated from college the technology I work with every day has changed several times. I’ve had to learn tools, techniques, and strategies that didn’t exist when I was in college. And my career has evolved through multiple employers, disciplines, and areas of expertise.